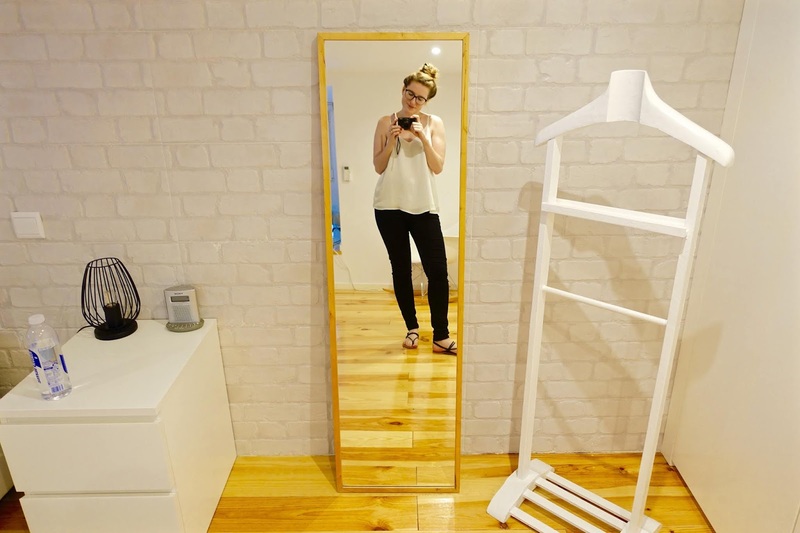 Our first Airbnb experience in Lisbon! 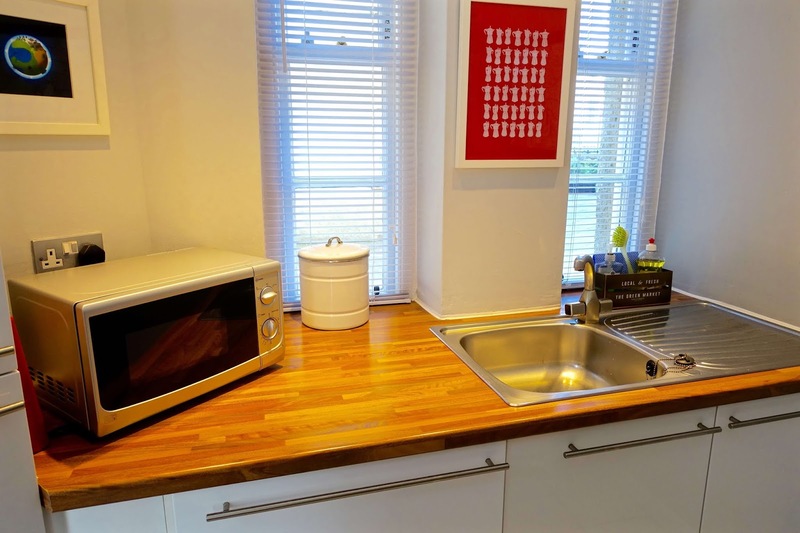 Airbnb. 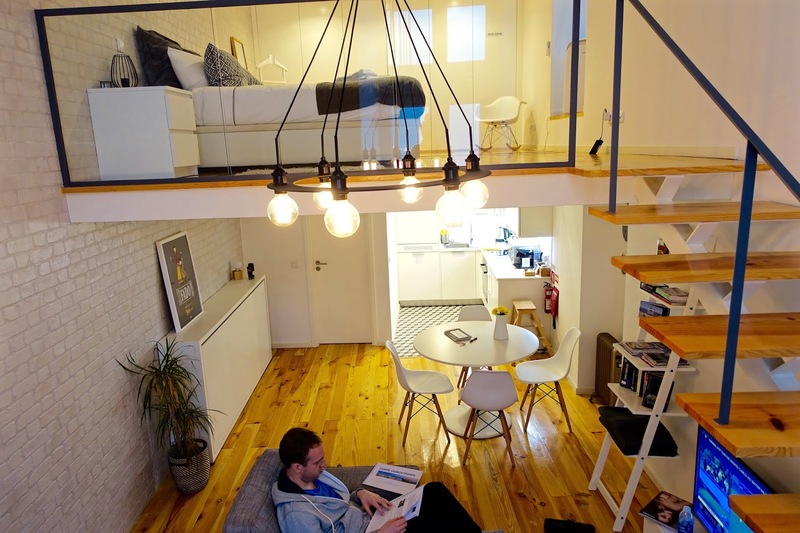 Everyone's heard of it, but have you ever stayed in an Airbnb property? I'm guessing your answer to that question is most probably YES - just like the majority of the universe! 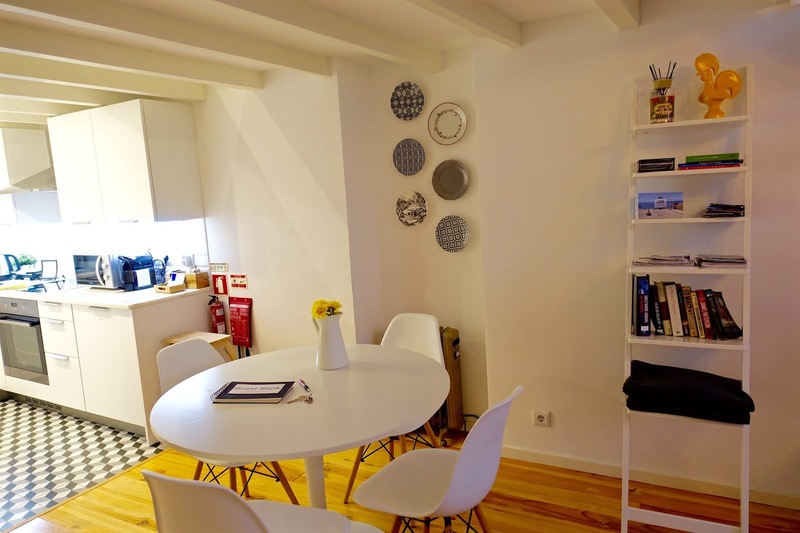 For us, believe it or not, it wasn't until our most recent trip to Lisbon, in 2018, that we booked and stayed in our first Airbnb property. Late to the party, I know! I'm not sure why we were so late to the party, maybe because I'm always so anxious I'll end up picking the dodgy property and it will all end in a massive shambles! For this trip, after much research and many positive reviews online we took the plunge. and how wrong was I to worry?! 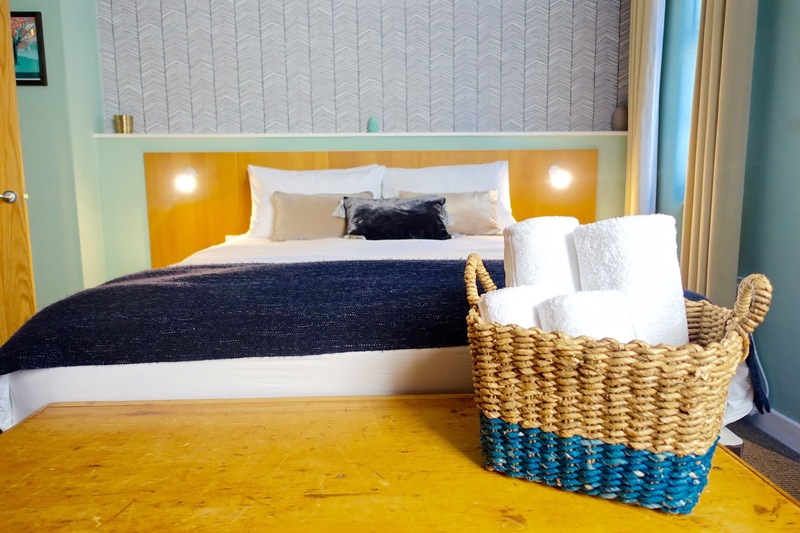 Lisbon was the absolute dream, a vibrant city, made, even more, dreamier, by the fact we had the most adorable Airbnb apartment in the heart of Barrio Alto, located right in the centre of The Bica Elevator Street where the famous tram 28 stops right in front of the apartment. As soon as we arrived, there was a cool, buzzy vibe. There are a couple of bars and restaurants quite local to the apartment, some a few blocks away, so naturally there does tend to be some noise on an evening, however, we didn't have any trouble sleeping during our stay and were happy to tolerate a little bit of hustle and bustle on a night-time in exchange for having a base to stay that was super central and close to neighbouring Baixa and Chiado. 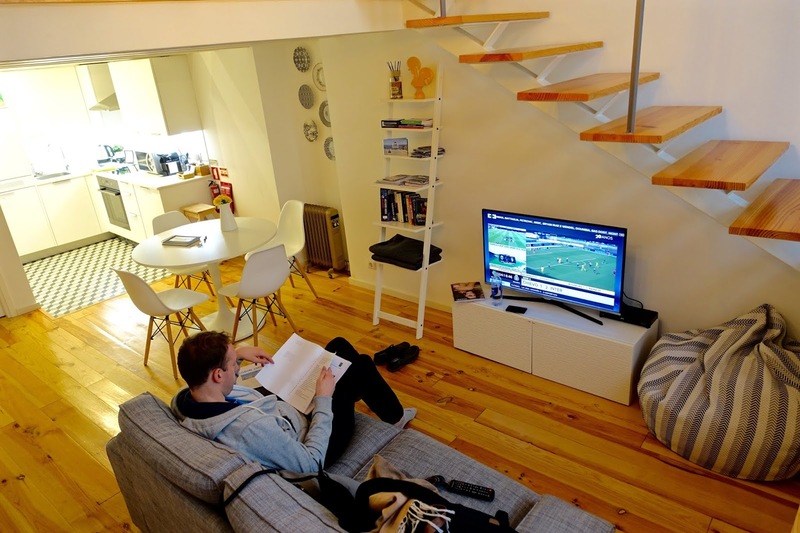 As you can see from the photos, the apartment was super modern, very spacious, light and airy and had all the essentials we needed for a short weekend break to Lisbon. 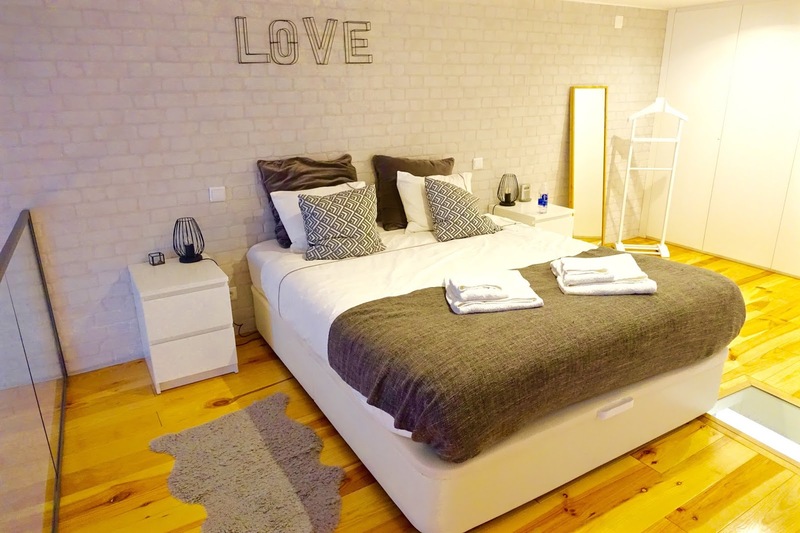 This apartment can easily sleep 3; there's a single bed which can be put up downstairs in the living area, however, I think its the ideal base for two! 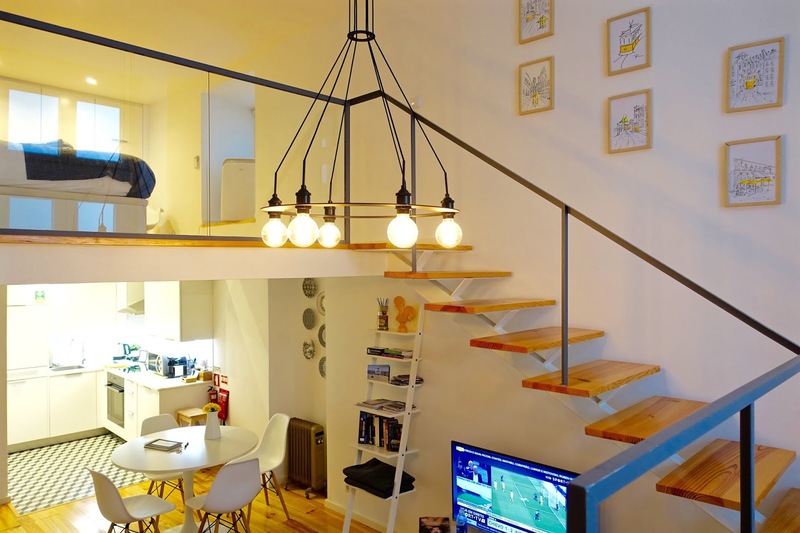 It has a really cool setup, with trendy split level living - the spacious bedroom, with plenty of storage space on a raised second level (via stairs) and the living area, sitting/eating area with combined kitchen. The bathroom with shower is also on this level. 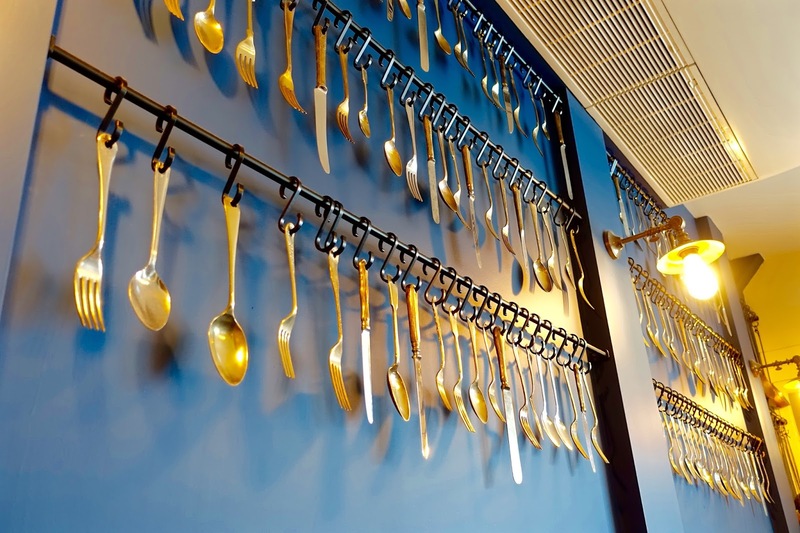 If you're a keen foodie, then this is an ideal nesting spot for you. The Time Out Market in Lisboa is right on your doorstep - literally a 2-minute walk down the elevator. 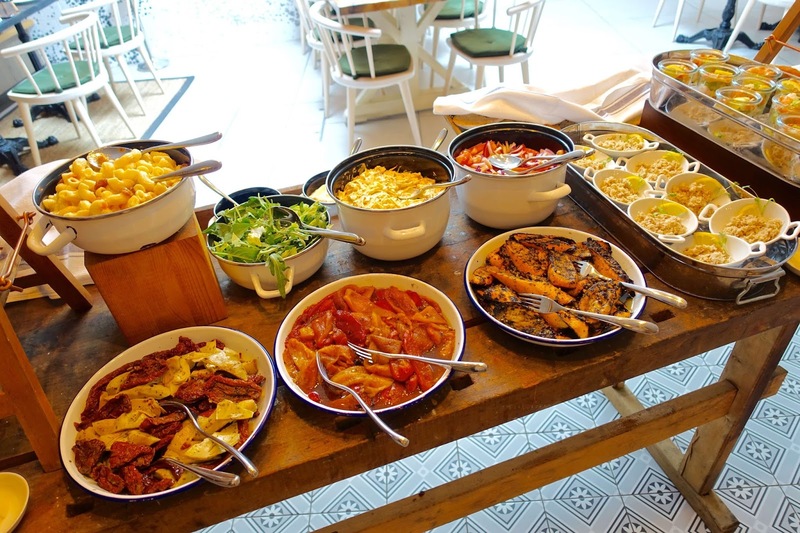 Lisbon's Time Out Market is basically a huge foodie hall full to the brim with lots of different local food vendors (and provides plenty of choices), some of them from very well-known Portuguese chefs! 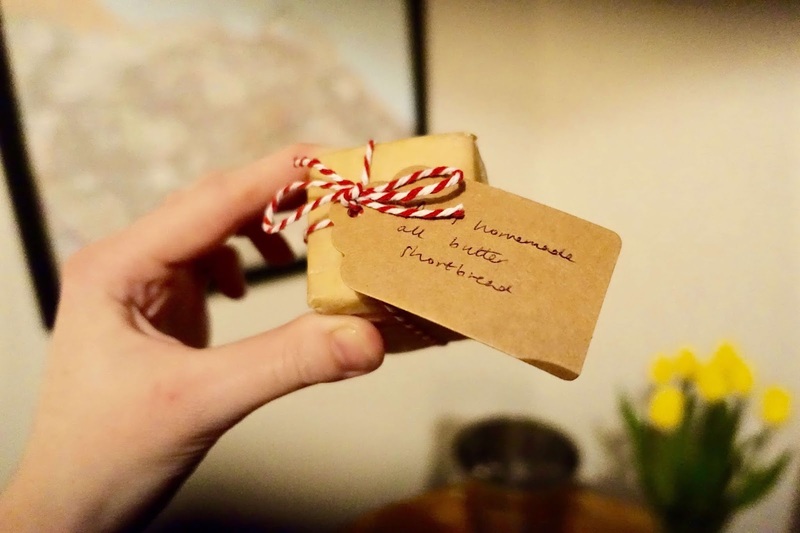 Maybe you're reading this feeling a little dubious about food markets, but you can take comfort in the knowledge that the Time Out Market is the first market in the world where everything on offer has been chosen, tried and tested by an independent panel of city experts. Take it from me, during our 3-day trip we couldn't help but head back here every day to try a new snack. It was far too tempting! 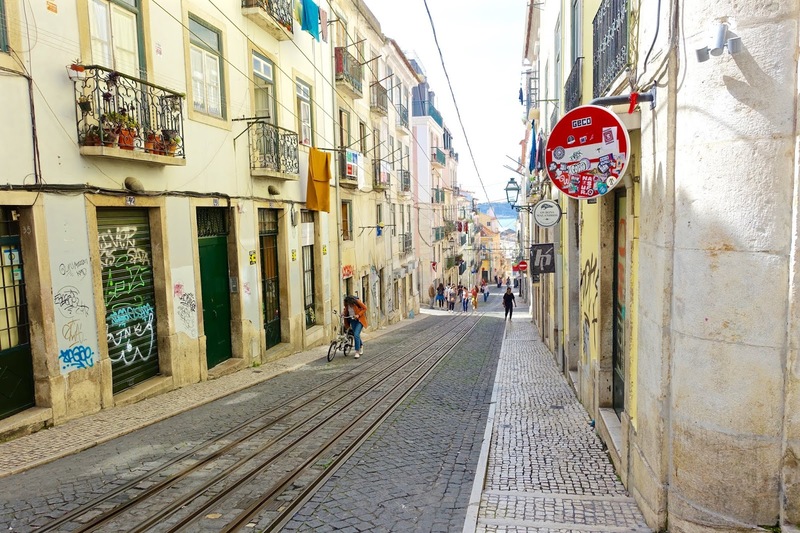 We absolutely loved our time in Lisbon and would LOVE to go back to again. 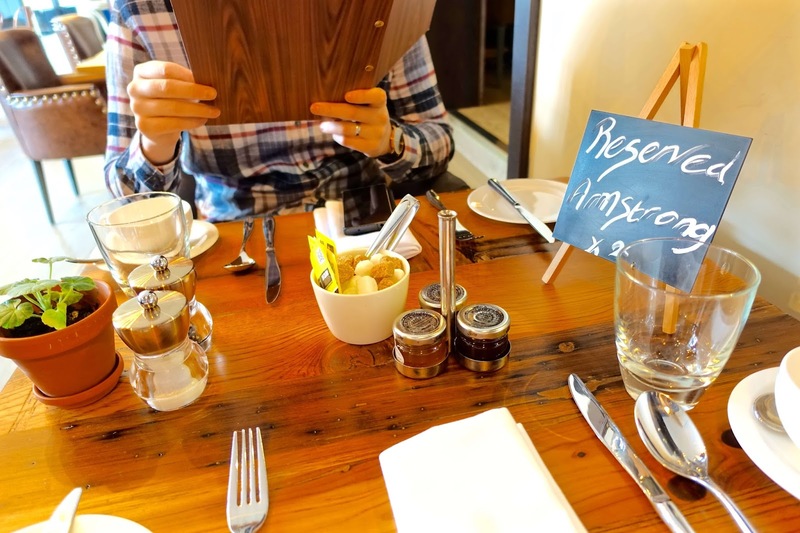 We had so much fun exploring the city and loved its rustic vibe and charm. I think next time, I'll look to try another Airbnb in a different area of the city, as I'm sure there's plenty more to see and do. 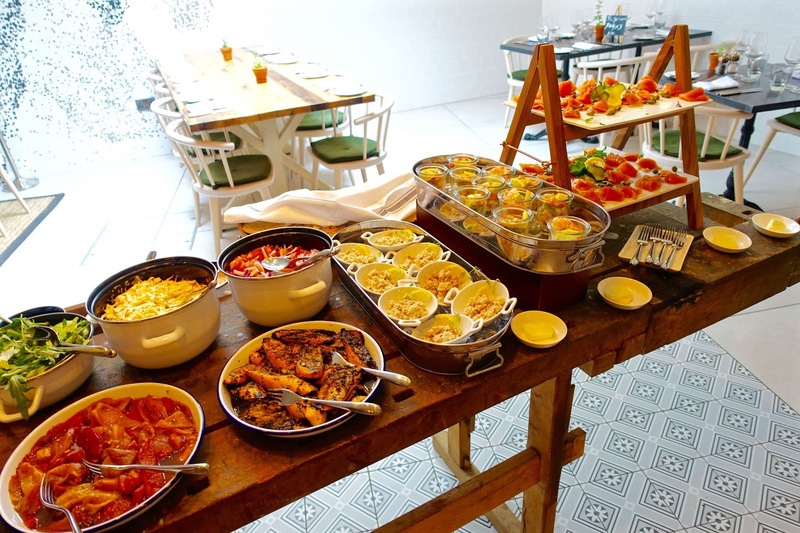 Have you visited Lisbon before? 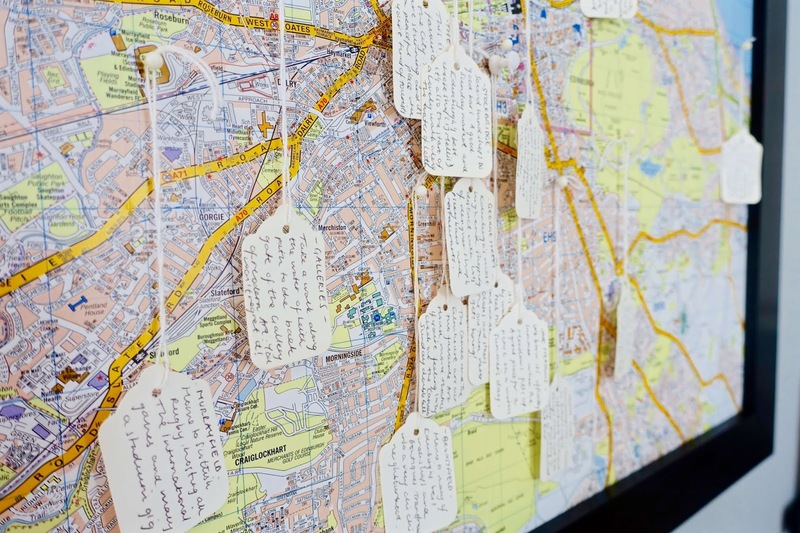 If so, where would you recommend staying? Leaving work on a Friday evening after a long week at work, knowing that I only needed to drive a mere 10 minutes down the road to reach my next destination; the Running Horses Pub in Mickleham, located just outside my place of work in Surrey! To give you a little bit of background, the Running Horses pub is believed to date back to the 16th century and sits opposite St Micheal's Church (a church which was once mentioned in the Domesday Book) - although, it appears that there is still a lot of history surrounding the pub which is yet to be discovered, which adds to the charm and character of this little place hidden amongst the Surrey Hills. 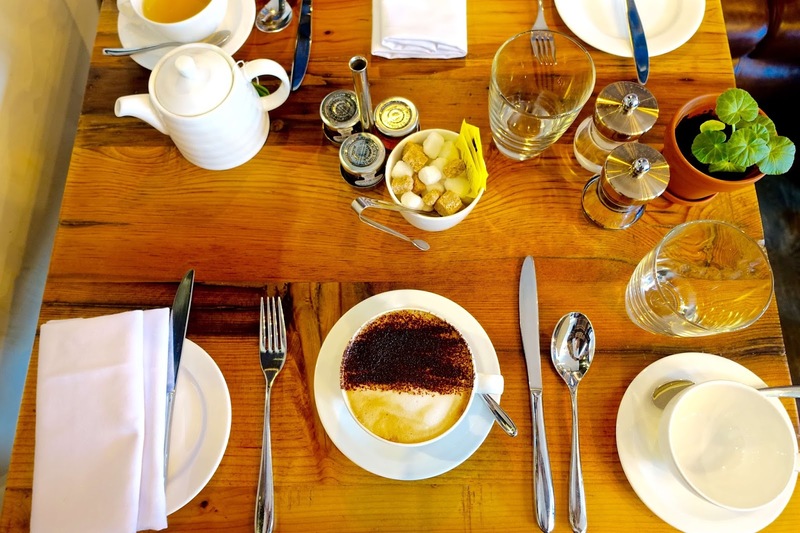 If you're not familiar with Mickleham, it's a small village in the Surrey Hills, sitting on the doorstep of Surrey's famous National Trust site, Box Hill - a great attraction amongst keen cyclists and walkers, as it boasts amazing views across the North Downs. 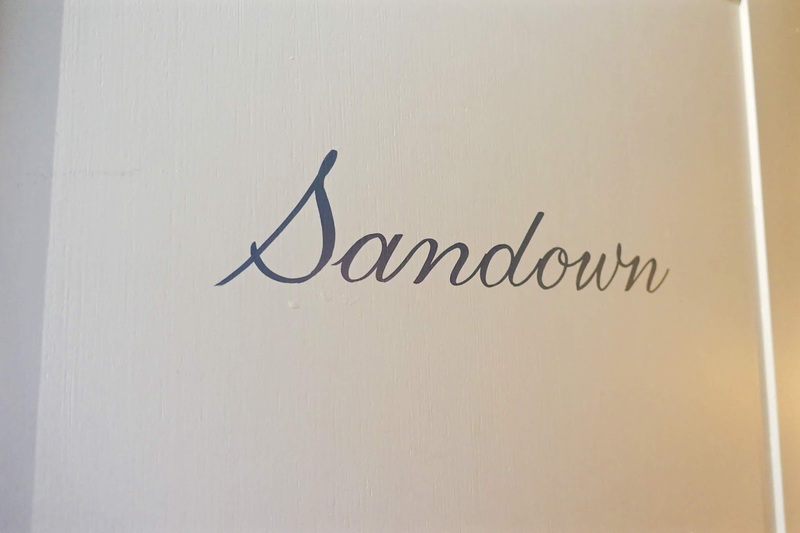 We spent the evening/night in Sandown; a luxury en-suite double room overlooking the front, outdoor terrace of the pub - perfect for alfresco dining on a summer's evening and clearly a popular drink-spot for passing cyclists! Our room was very quaint and characterful, complete with creaky floorboards (what do you expect from a 16th century pub?) and split-level mezzanine; the en-suite bathroom with luxury rainfall shower immediately on your left, then you follow a few stairs up a raised second level which houses the bedroom complete with double bed, a small storage space for hanging clothes and a desk with chair and coffee facilities! 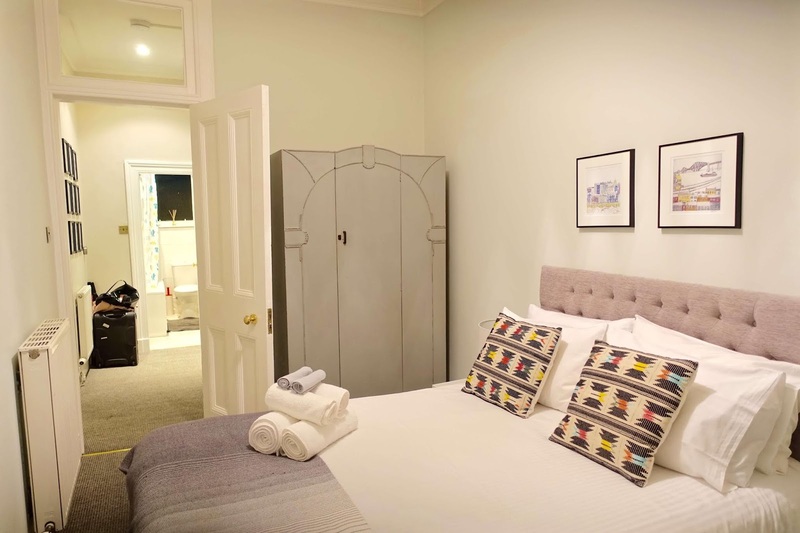 Prices are very affordable, from £89 per night, with one of five double rooms to choose from, or you can upgrade for £10 more per night to stay in the Gatehouse, which has its own private entrance at the back of the hotel. 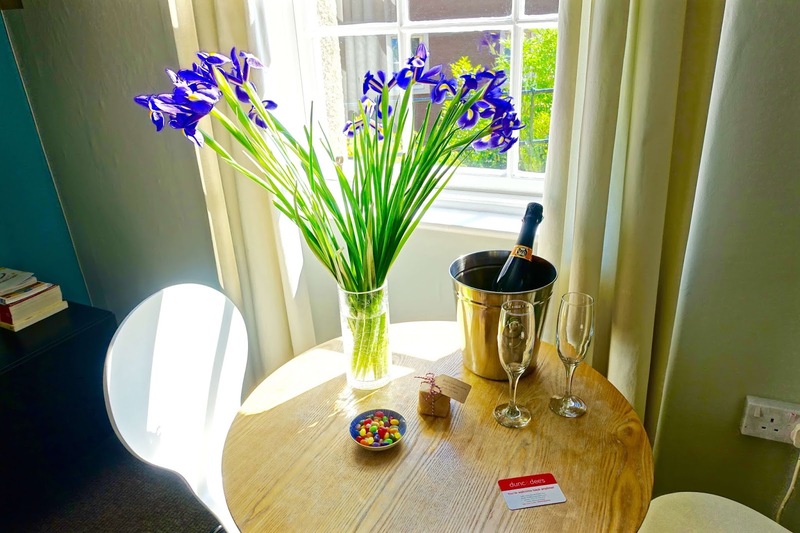 The amenities of our room were basic compared to other hotels I have stayed in, however, features most things you would require for an impromptu overnight stay in the countryside. Our room had free wifi (sadly the majority of the time an essential for me, as I'm usually posting coverage while I stay), a Nespresso coffee machine (fresh milk is available from the bar downstairs) sparkling water, Temple toiletries and blackout blinds for an uninterrupted night's sleep! 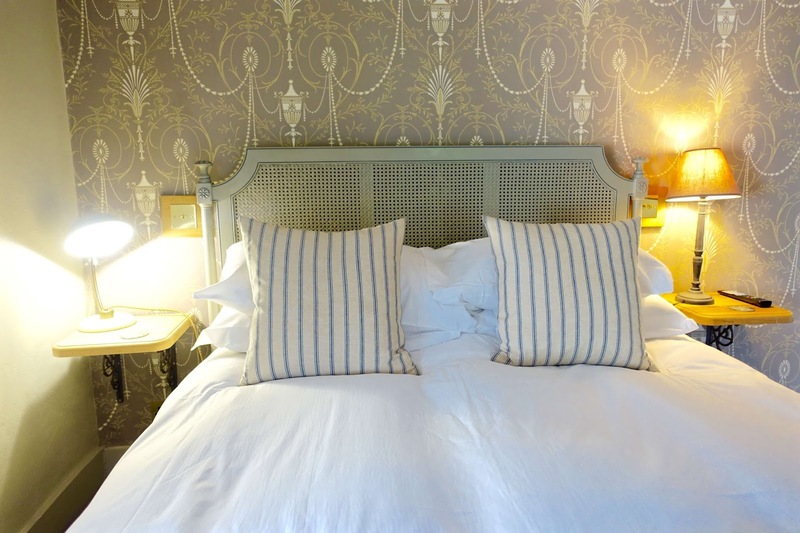 The bed featured plush bed linen and big, squishy pillows - as soon as my head hit the pillow after dinner I was out like a light! 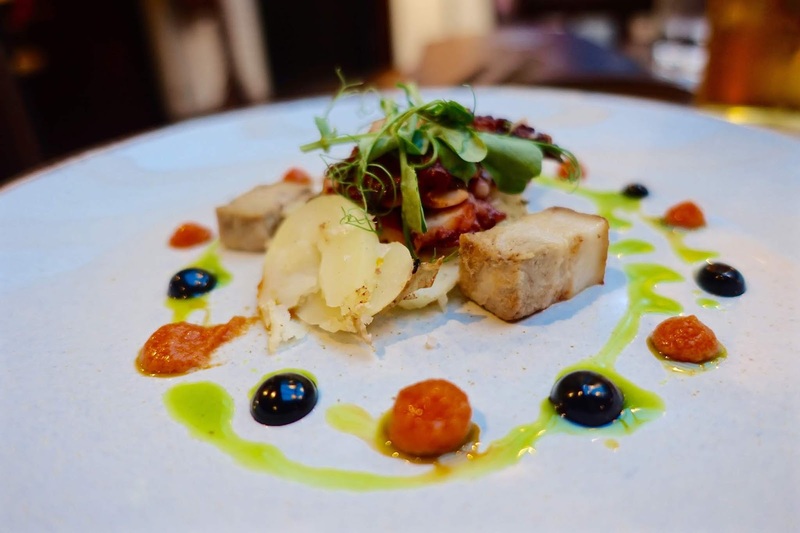 Alongside our overnight stay, a three-course dinner was included with a bottle of house wine, which will set you back about £80-100 per couple. 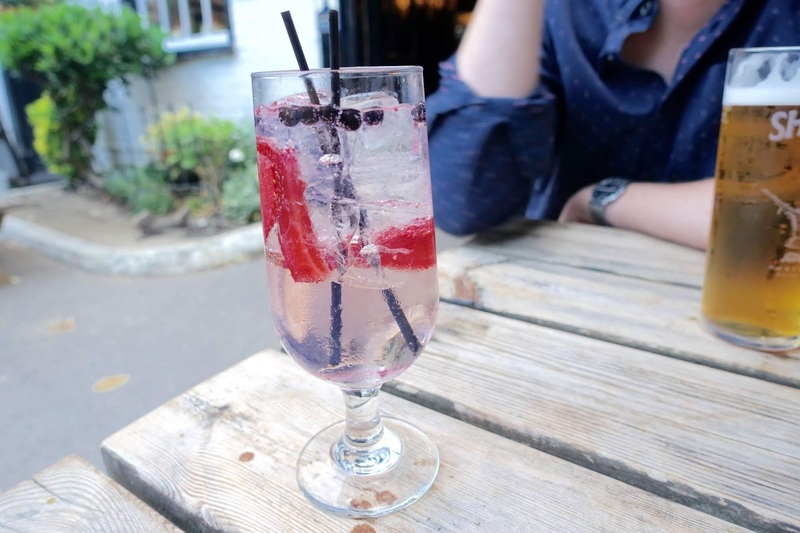 In true British style, we made the most of basking in the summer evening sun and grabbed a gin and tonic to sip outside the front of the pub before we were to be seated inside for the duration. 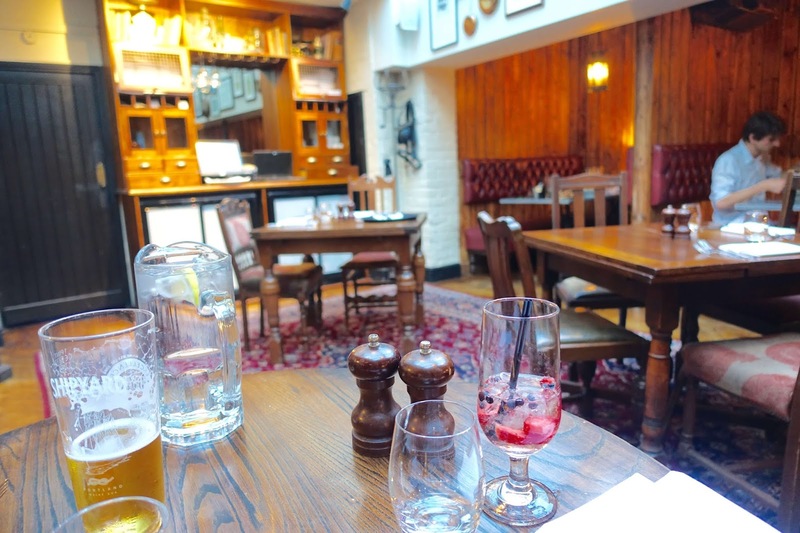 The lighting and atmosphere in the pub was very relaxed and laid-back which we loved. 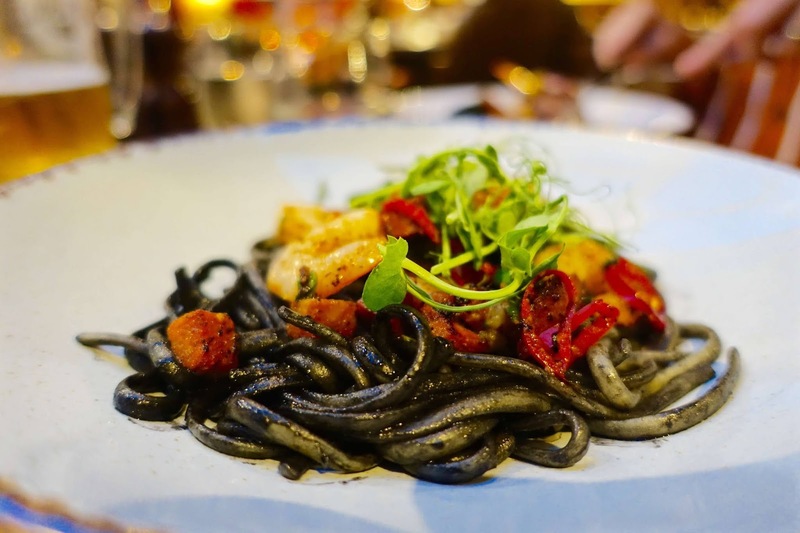 Alex and I ordered the Chef's special of braised octopus confit pork belly, chorizo puree, and squid ink mayo and steamed asparagus, smoked tomato, olive and shallot vinegarette, garlic crisps and herb salad to start and share - two bloody delicious starters! 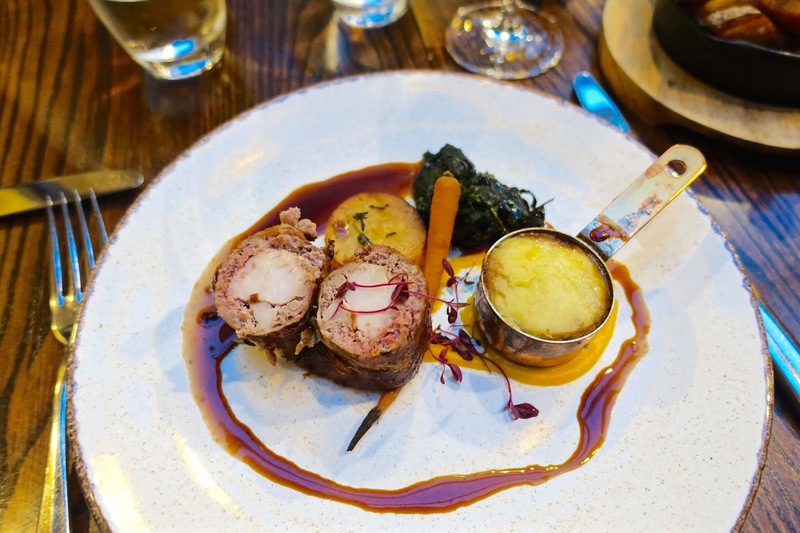 For the main course, I had Lion of rabbit, confit leg pie, carrot puree, sauteed spinach finished off with a drizzle of thyme jus and Alex had a squid ink pasta, washed down with a couple of glasses of house red each! We both absolutely loved dinner and were pleasantly surprised at the gourmet food options. 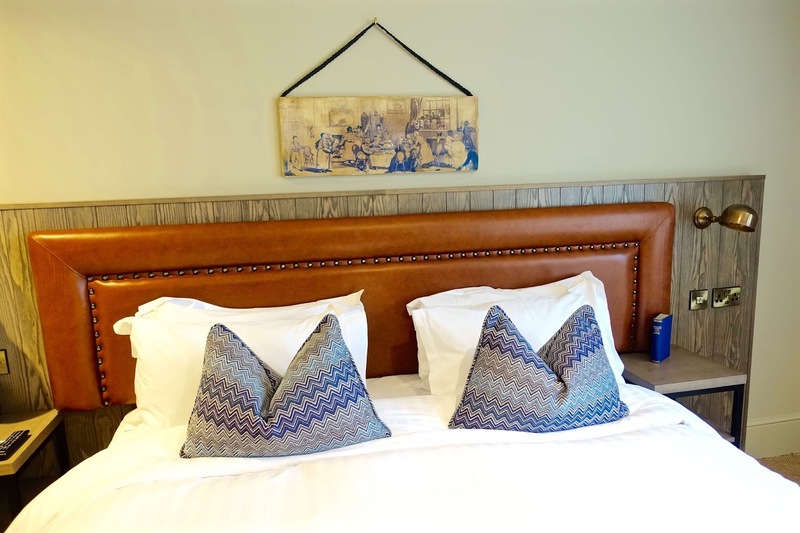 For other hotel options in Surrey, see my review of Ripley's historic coaching Inn or a cosy country inn retreat in Churt. Back in May me and Alex enjoyed a quick mini-break to Edinburgh which was absolutely fabulous. We were so lucky because the weather was glorious and we spent most of our time sitting outside indulging and drinking cocktails in the sunshine or walking here, there and everywhere. I've never stayed in central Edinburgh before so was super excited to be able to explore a new city. 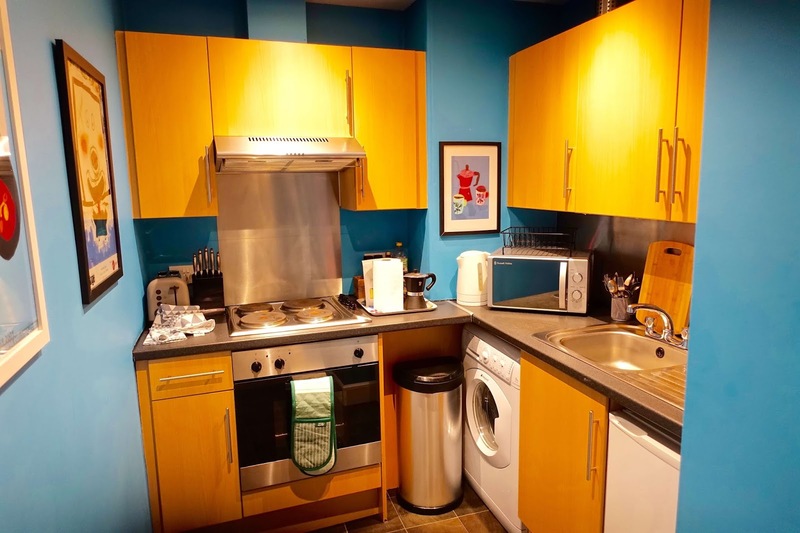 If your looking for a central base to stay in Edinburgh, then this apartment is perfectly placed, as its minutes from Edinburgh Castle, Princes Street Gardens and the famous Grassmarket district. 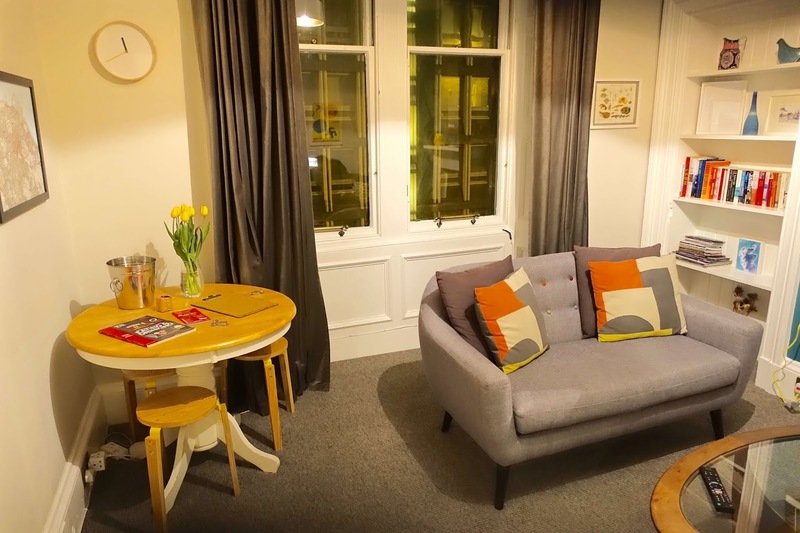 When researching our weekend break to Edinburgh, it was cheaper (and certainly much quicker!) for us to fly from Gatwick-Edinburgh late on a Thursday evening, so we arrived at the apartment around 11pm, after a quick taxi ride (around 15-20 minutes) from the airport. Check-in was super easy and stressfree - if you’re concerned about arriving late, there’s no need to fret. 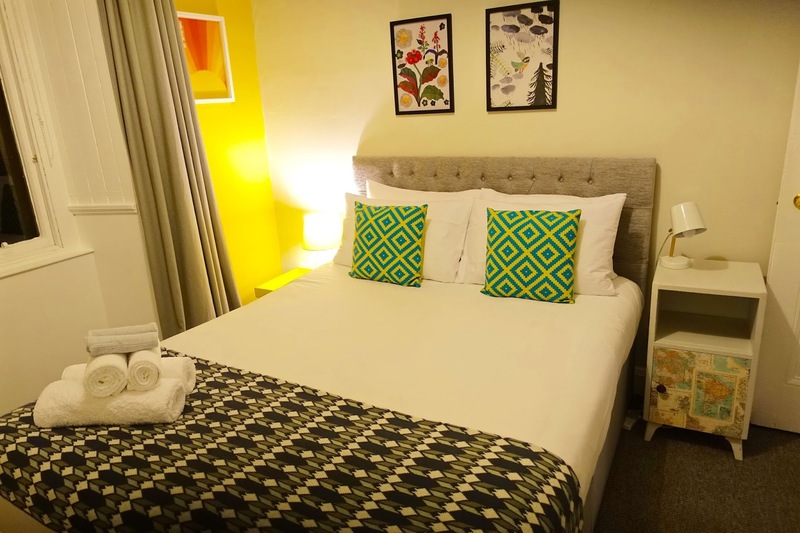 All of Dunc and Dee’s apartments have a key-box on the outside, and Dee shared a passcode with us before we arrived, so its super ideal for those who look to check-in outside of normal hours. 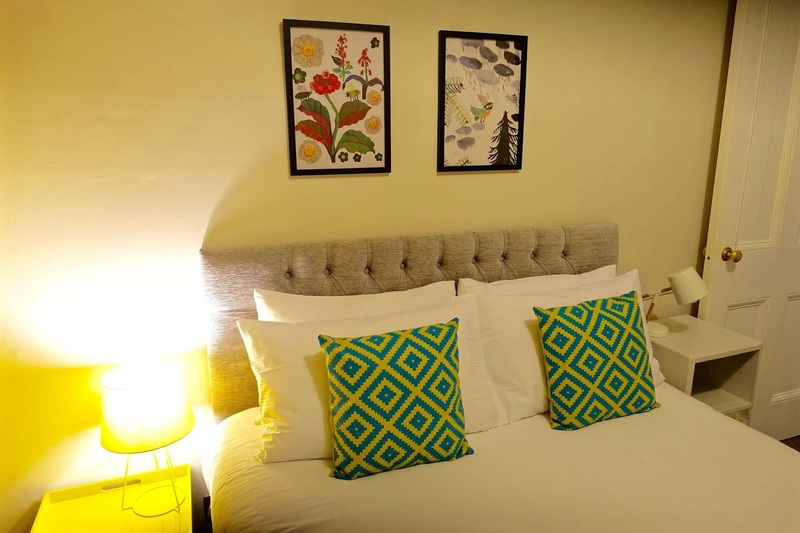 The apartment was vibrant and fresh throughout, with a unique style of new, vintage and up-cycled decor - the apartments are very boutique by nature. 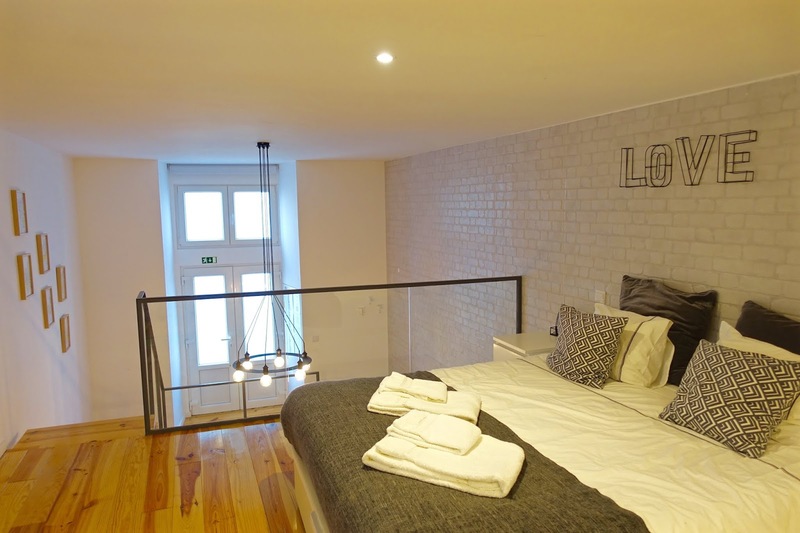 Each individual room was very spacious, yet cosy and homely at the same time. 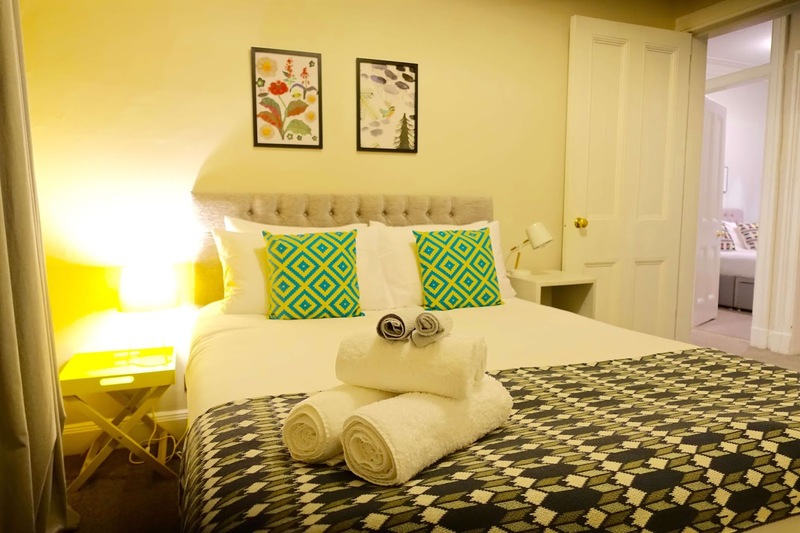 Dunc and Dee really have thought about all the little details and essentials you would need during your stay; a well-stocked kitchen with complimentary breakfast cereals, milk, tea and coffee and in the bathroom, a full range of toiletries are provided, plus fluffy white towels for each guest. 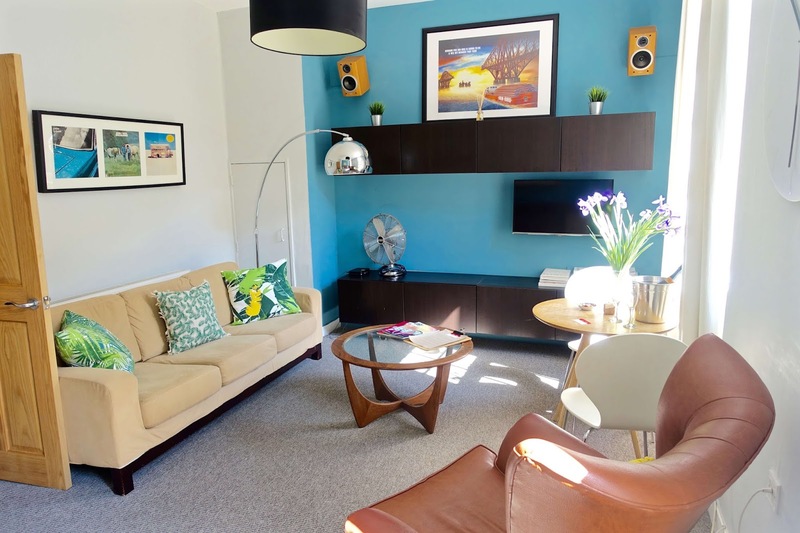 On our first morning waking up in Edinburgh, we had arranged to meet up with Dee to visit another one of their local apartments; the stylish old town retreat, which is in the nearby Grassmarket district. 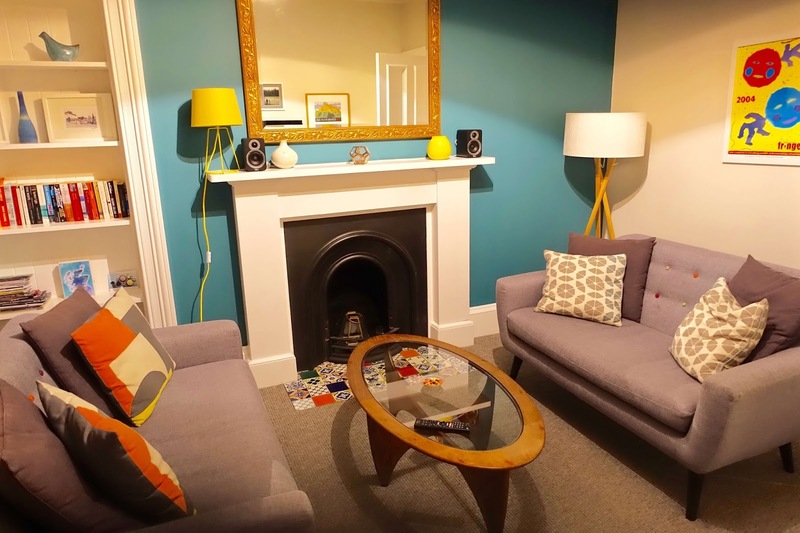 It was a quick five/ten-minute walk from our apartment on Lady Lawson Street, so would also be perfect if you're looking to travel as a group of friends to Edinburgh and would benefit from two apartments in close proximity of each other. 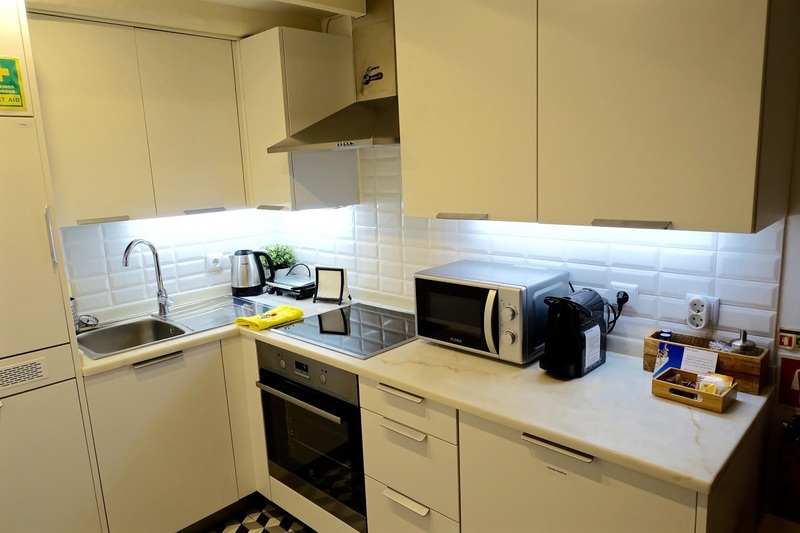 The old town retreat is the smaller apartment of the two with one-bedroom, however, is extremely spacious with a large double bedroom, separate bathroom, living area with dining space and kitchen - a brilliant base for two people. 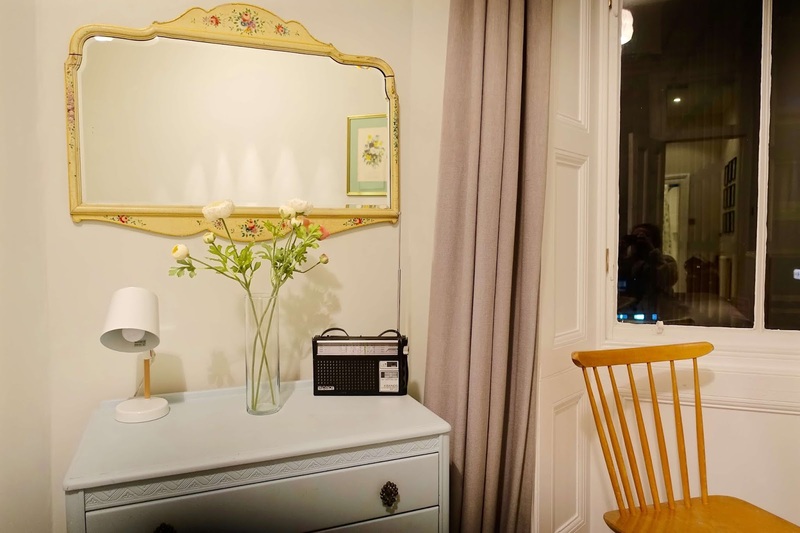 The second apartment was equally as glamorous with its quirky and individual character and style. A touch that we appreciated most was the local “food and drink guide” that clearly been given lots of thought and consideration from Dunc and Dee. 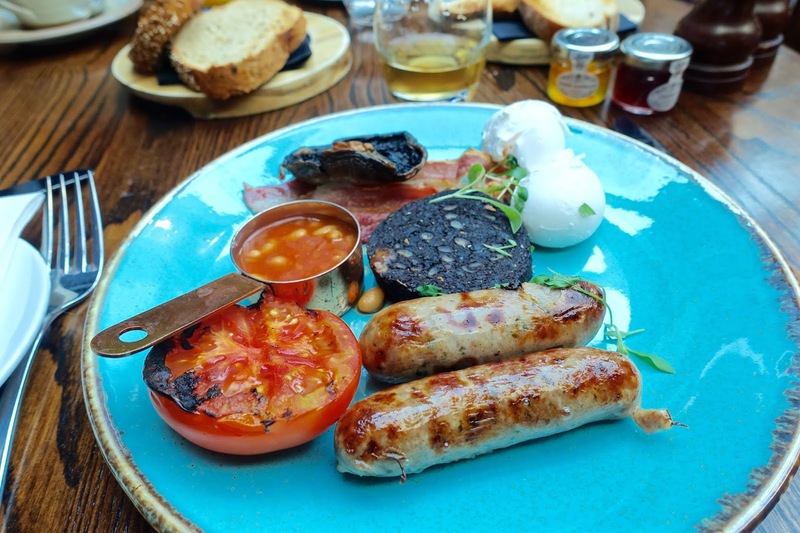 Before embarking on a weekend away I would usually spend a good few days researching the best restaurants and cocktail hotspots to visit, however, I admit, on this occasion I was awful so the food and drink guide was very welcome indeed! Dee is a chef so the hosts really do know their stuff when it comes to recommending local foodie hotspots. The more I travel, the more I have developed a penchant for seeking out quirky and boutique accommodation; less and less am I drawn in by the standard hotel chains - sometimes its ideal for convenience, however, I find it so much more exciting locating a hidden gem, which offers much much more in terms of hospitality, individual style and personality and all the home comforts for a very competitive price! 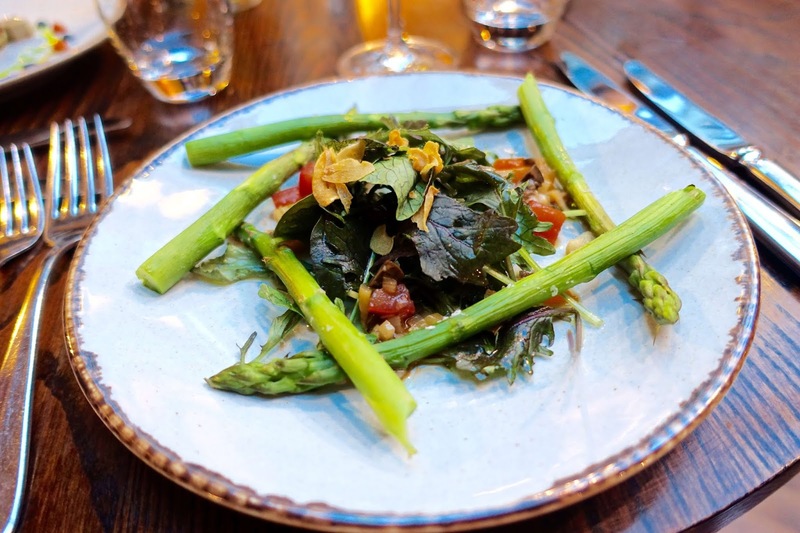 In my next blog post, I'll be sharing what we got up to, plus all of our new favourite foodie hotspots and cocktail hides in Edinburgh. 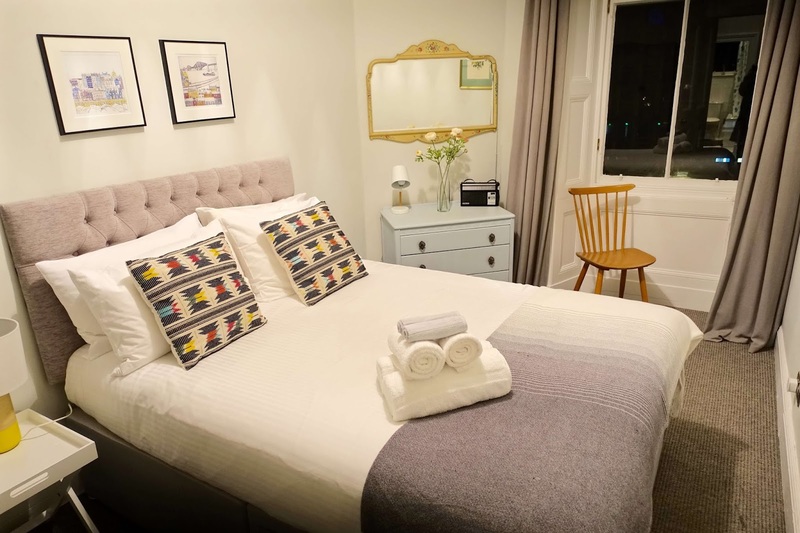 Where's your favourite place to visit/stay in Edinburgh? 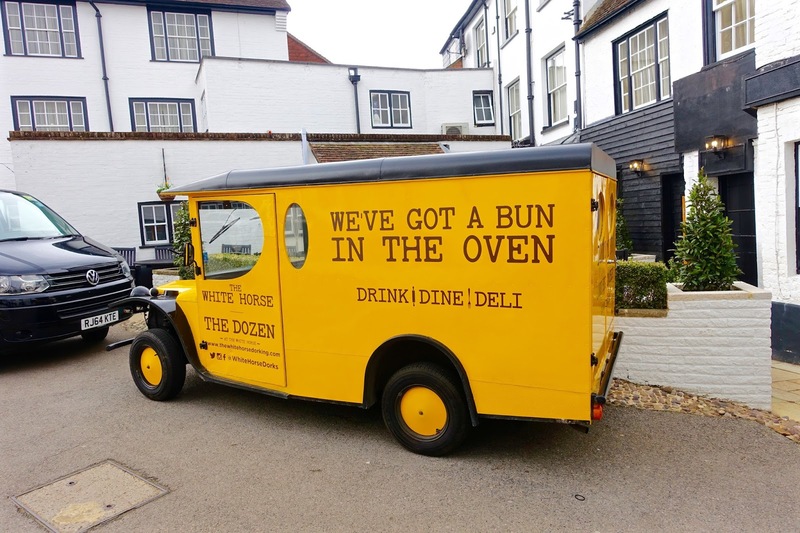 I am very fortunate to live super close and work in Surrey, an area of outstanding beauty and surrounded by plenty of cliche rolling hills, where you'll also find the quaint, historic market town of Dorking, with its cosy cafes and quirky independent outlets. 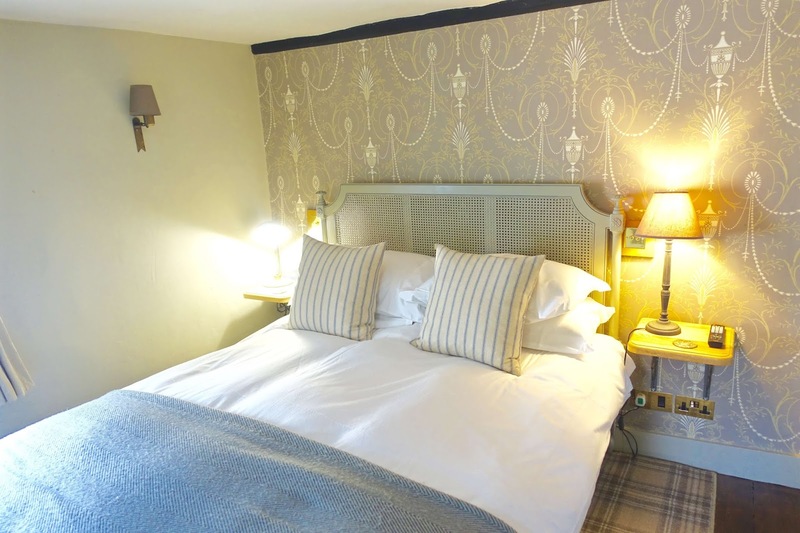 The historic White Horse Coaching Inn which sits in the middle of Dorking high-street houses 56 bedrooms - you would not believe this is possible from the outside! 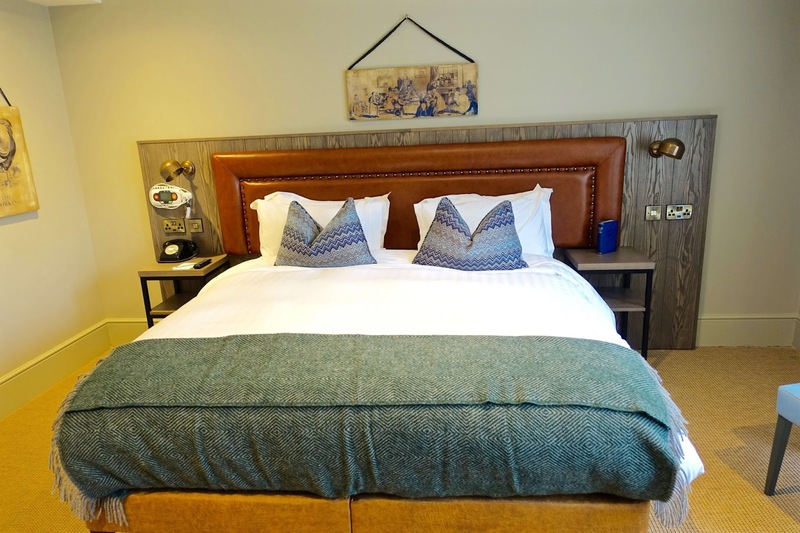 The hotel has been taken over by Bespoke Hotels (who also own The Talbot, in Ripley where I previously stayed and wrote about here) It's great to see that the hotel has been sympathetically and comfortably modernised, while retaining lots of its original character and charm. It's the perfect pairing of old and new. We were here to check out the all-new bar and deli concept, The Dozen. 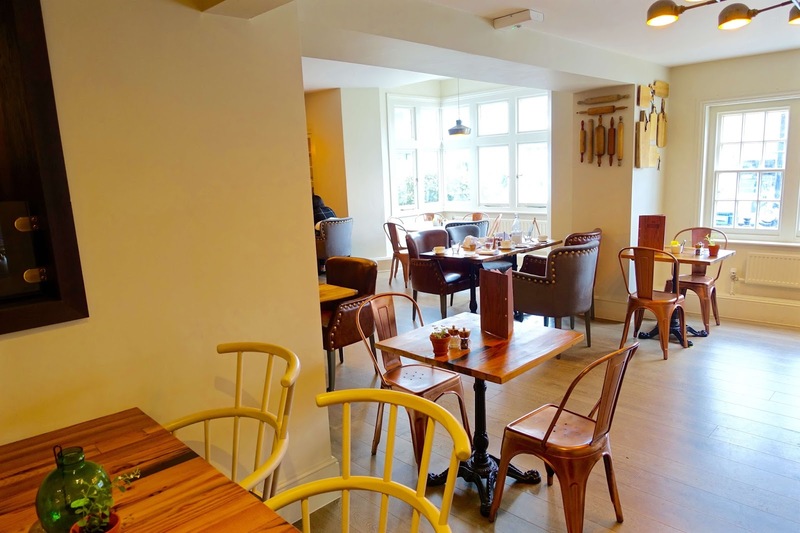 Service was prompt and the staff were very friendly, full of smiles and equal parts chatty. 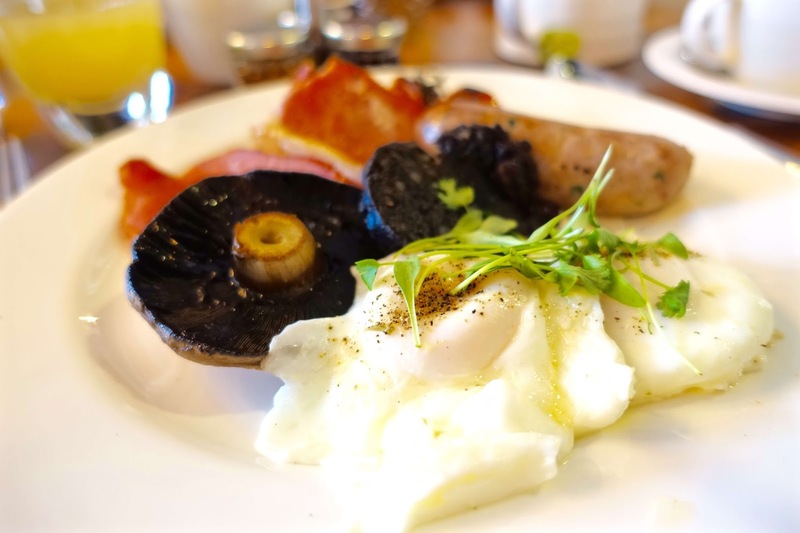 Breakfast arrived in the form of a very tasty full-English complete with black pudding, a large field mushroom, and locally sourced sausages, bacon and hens eggs. 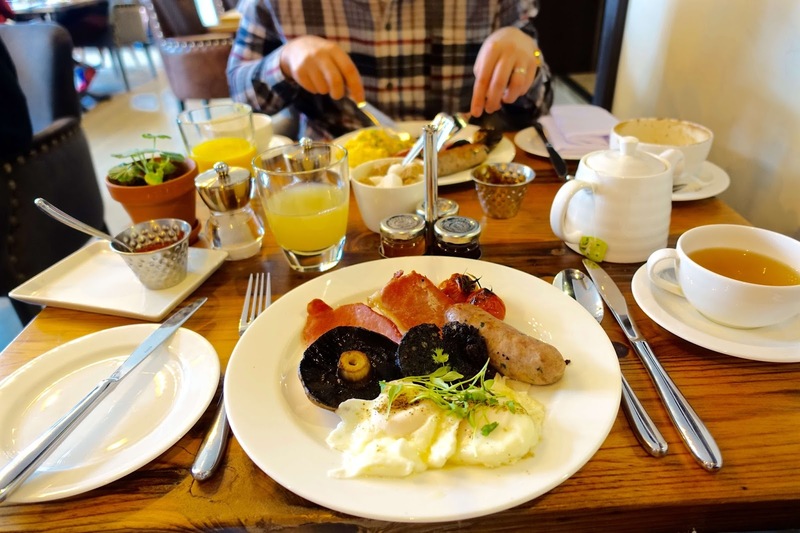 Breakfast included special additions such as service from a waiter suited and booted in a tweed waistcoat and denim shirt (how cute!) 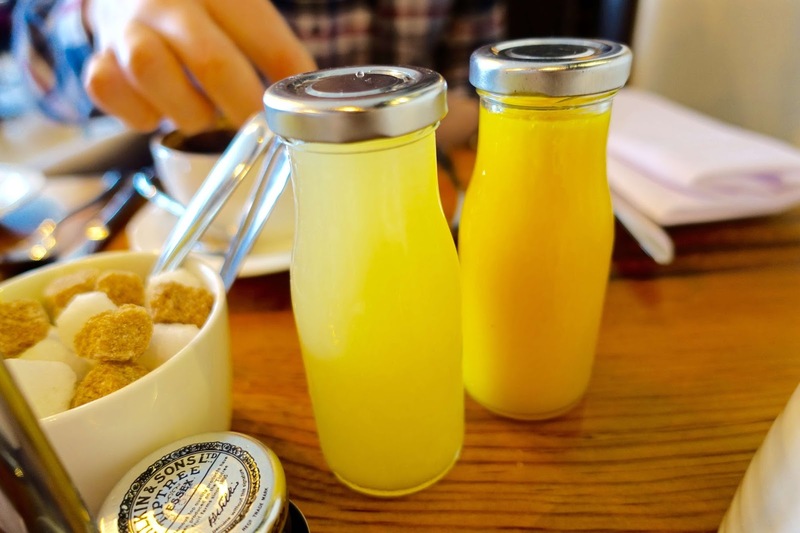 and locally pressed apple and orange juice served in small and dainty glass jars. 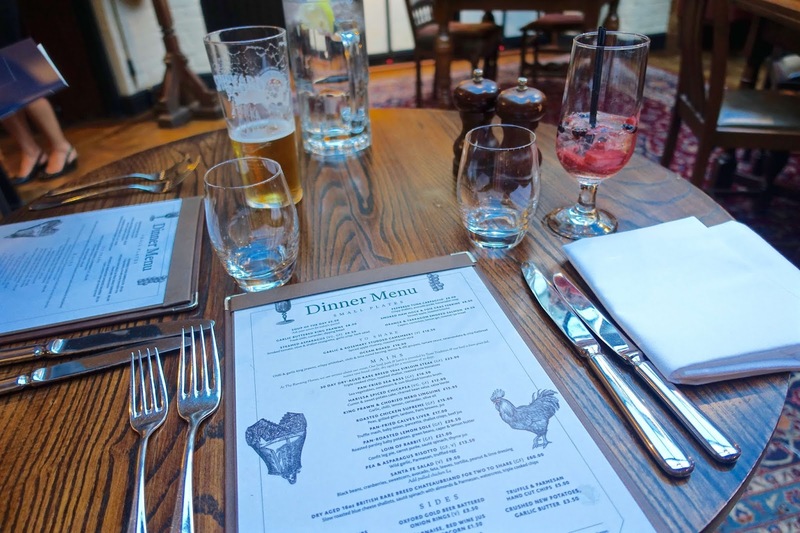 Most importantly, I love that many of the ingredients are locally sourced, as well as the ales and wines at the bar from local Dorking breweries and vineyards, celebrating the very best in local, Surrey produce. 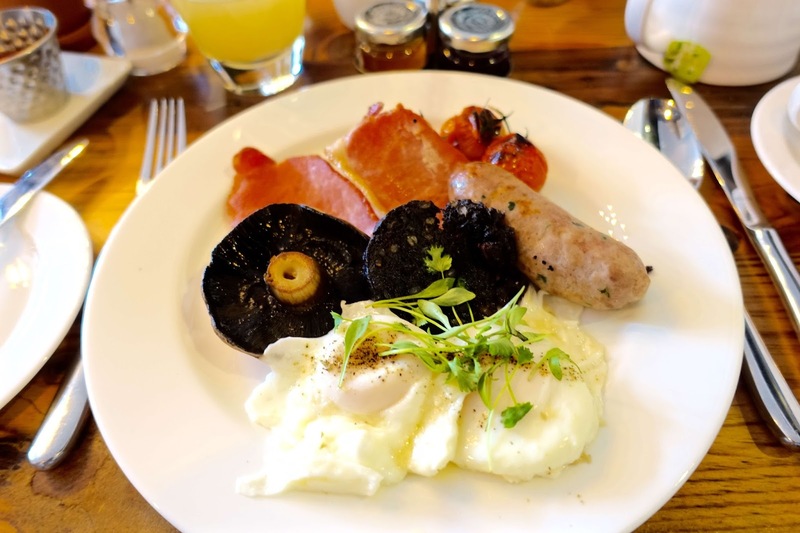 As we were brunchin' on a Sunday we were able to see their "Sunday Luncheon" menu in full swing; a 3-course Sunday Lunch offered at £27.95 per person. The first course, is served as a country table spread, a help-yourself-buffet which looked absolutely delicious by the way (see the pictures above!) 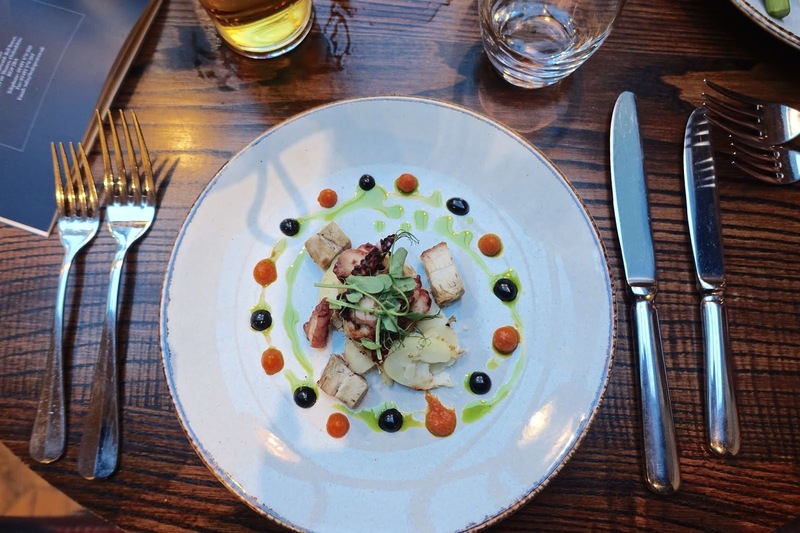 with a selection fresh seafood, crustacea, charcuterie, pates and a selection of salads, vegetables and freshly baked artisan bread, local chutneys and sauces. 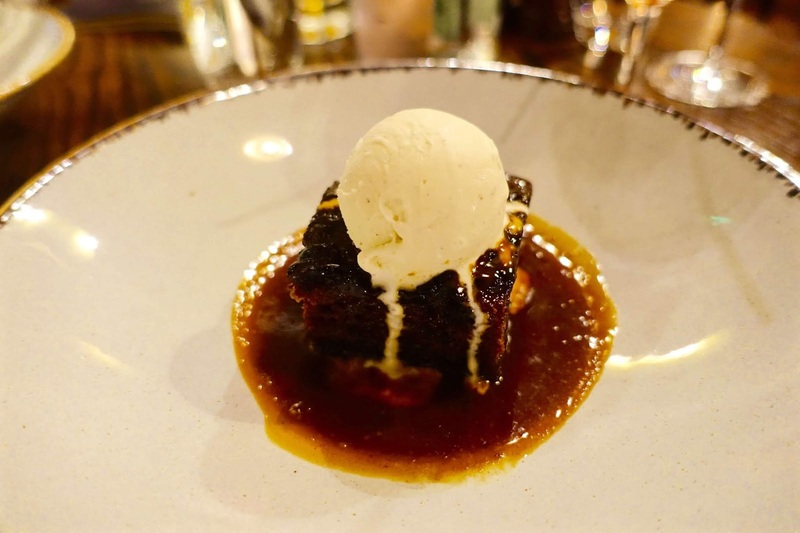 This is followed by the main event and then tastebud tempting puds like hot sticky toffee pudding, butterscotch sauce, and vanilla ice-cream. We then had a tour of the rest of hotel and the premises from the wonderful General Manager, Rebecca. 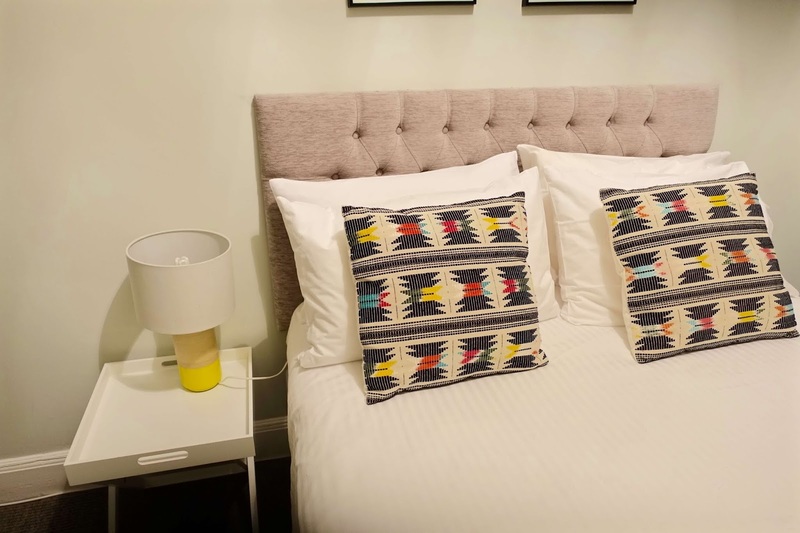 The bedrooms are contemporary and spacious with grey and green touches and luxurious headboards with contrasting textures of leather and wood. 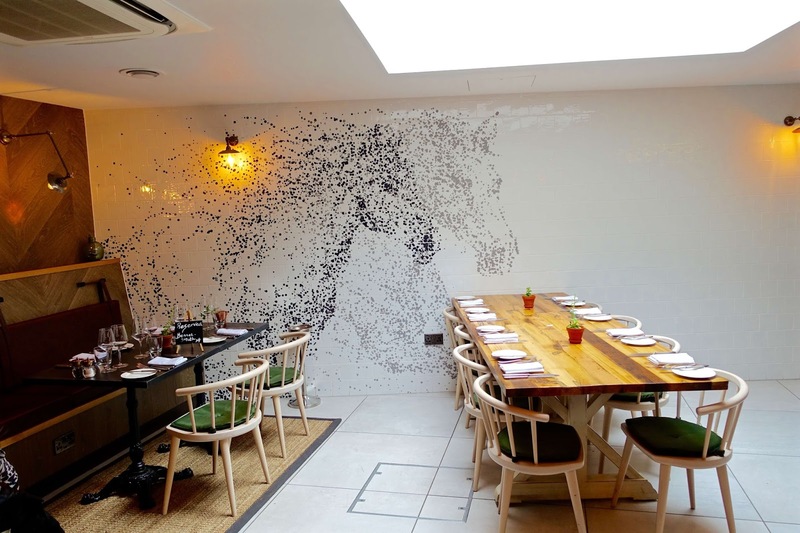 The White Horse offers something for everything, a casual, laid-back vibe for your girly weekend brunch or mid-week date night. 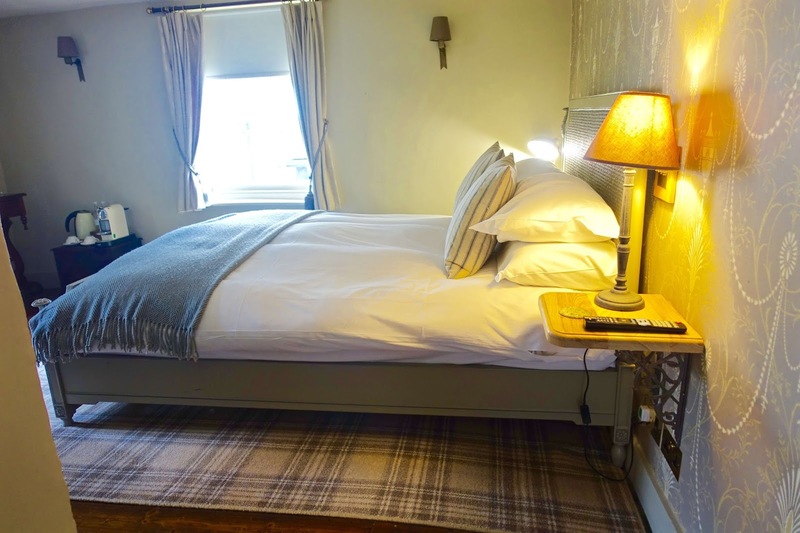 If you're visiting Denbies Vineyard (a short 10 minutes in the car) then The White Horse is definitely a great base to stay for the night, or if you're more the explorer-type, the surrounding North Downs and Surrey Hills provide excellent walking and cycling routes for a weekend of exploring, as well as plenty of fabulous views!